A beautiful wine decanter is the perfect centre-piece to any party...but cleaning it afterwards can be time consuming and frustrating...right? Those pesky water marks that even the curviest brush doesn't quite reach? Those rinse trails that the sunlight catches when you thought you'd achieved perfection? Don't hide your decanter away - display it today! And there's no more worrying about your expensive decanter being balanced precariously in a cupboard after use (especially when a certain someone puts it away), because our decanter drying stand acts as an elegant 'armchair' for your hard working decanter to sit in (between uses that is). Made of top quality stainless steel, our decanter drying stand really is the perfect sideboard companion for your decanter. With its classic, timeless design, it won't outshine the star of the show - but it will keep it safe, secure and in pristine condition! We've even added a special rubber coating so you don't need to worry about any scratches occurring while drying or storing. Order today and give your wine decanter the after-dinner date it's been waiting for. If a lifetime partnership doesn't blossom...for whatever reason, we offer a money back guarantee. STABLE, FUNCTIONAL DESIGN KEEPS YOUR DECANTER SAFE - Versatile, modern design fits all standard sized decanters whilst also displaying them beautifully! 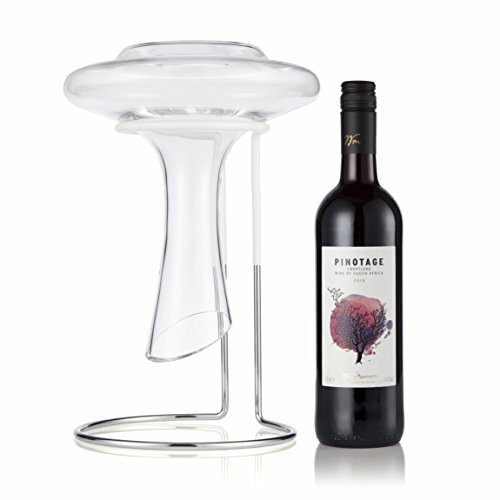 WORRY FREE PURCHASE - We are sure you will love The Wine Castle's decanter stand however should you need to return it we offer a money back guarantee. So don't delay - order today! If you have any questions about this product by The Wine Castle, contact us by completing and submitting the form below. If you are looking for a specif part number, please include it with your message.